Instruments illustrated on Arderne's writing. He produced the definitive work on treating this particular medical problem. His writing describes the cause and the treatment, and describes the surgical instruments needed for his procedures. He also shows knowledge of Galen & Guy de Chauliac, Avicenna, and Dioscorides. The summit of Mont Ventoux. Beyond the tower is a chapel built in the 15th century. The "Beast of Provence" (also known as the "Giant of Provence" or "Bald Mountain") is actually Mont Ventoux [Mount Windy] in Provence. You have probably seen it on television: it is a major part of the Tour de France. It is made challenging not only because it is the highest mountain in the region, but also because of the high winds near the summit. Winds blow over 50 miles per hour for the majority of the year, and speeds of 200 miles per hour have been recorded. The road over the mountain is often closed due to wind conditions. The history of the Beast has always included an aura of foreboding, not just because of the wind. Its limestone peak—which can be seen from miles away—allows only sparse vegetation to grow, and so "Bald Mountain" appears to be barren and imposing. It is unlikely, however, that Petrarch was the first person to climb the mountain since antiquity—even besides the old shepherd. Jean Buridan (c.1300-1361) took a break from teaching at the University of Paris to climb the Beast, probably years before Petrarch. As for doing it "for pleasure": there are German writing from the 10th and 11th centuries about climbing mountains as a pastime. Let's see...so many to choose from. Founding of the Order of the Garter in 1348 by Edward III. The story of the founding of the Order is well-known and unverified, told by Froissart, who loved court stories but wasn't present at the time (and was only a child). It tells us that the Countess of Salisbury lost her garter while dancing at a court ball, to the discourteous amusement of the guests. Edward III gallantly picked up the garter and handed it back to her, saying "Honi soi qui mal y pens. "["Shame to him who thinks evil."] This, supposedly, inspired him to create a chivalrous order named for the Garter. The Countess of Salisbury in question might have referred to Joan of Kent, who later became his daughter-in-law when she married the Prince of Wales (Edward, "the Black Prince"). Otherwise, it was Joan's mother-in-law, Catherine Montacute, whose husband was the 1st Earl of Salisbury. Later rumors were that she was the focus of inappropriate affection from Edward. Other sources claim that Richard Lionheart had his soldiers tie garters around their legs in some acknowledgement of St. George, and that Edward wished to evoke both Richard and George when founding the Order. Whatever the case of its founding, it is the most exclusive and prestigious Order in England and Wales, limited to the king, the Prince of Wales, and 24 additional knights. The original list is a Who's Who of political power in mid-14th century England—although some of them had to be knighted in 1348 to be able to receive the honor of the Order. "Ladies of the Garter" were also appointed, though without the prestige accorded the Knights of the Garter. King Henry VII ended this practice, but King Edward VII named his wife a Lady of the Garter, as did King George V and King George VI. Queen Elizabeth II is an ex-officio member of the Order. Recent events in Boston have underscored what Americans do not know about world geography. The news that the alleged bombers were Chechen, from Chechnya, led many to link them erroneously to Czechoslovakia. Chechnya, in the North Caucasus (north of Georgia, between the Black Sea and the Caspian Sea), has a long and varied history. The first time that the history of the area would overlap with topics dealt with by DailyMedieval is in the 13th and 14th centuries, when Mongols launched a prolonged effort to expand into Chechnya. At the time, however, it was not called "Chechnya" and was not Muslim; it was the region occupied by the Vainakh kingdom. The Vainakh were a branch of people who spoke one of the Nakh family of languages. The Nakh language is still spoken by Chechens, Ingush and Georgian Kist peoples. Prior to the Mongol invasions, the region was influenced by Georgian Christian missionaries, although conversions were rare. They also traded with other areas cultures: Mesopotamian coins have been found, and a cache of 200 Arabian silver drahims from the 9th century. One of the effects of the Mongol invasions was the severing of easy communication with Georgia, after which Vainakh paganism re-asserted itself. The Vainakh religion has similarities to Celtic beliefs, and some* think the Celtic Alans/Alauni might have come from the Vainakh region. Among the similarities that support a connection are veneration of trees, particularly the pine tree on the Winter Solstice, festivals at the time of Beltane and Halloween, and a wide range of gods. Tamerlane (1336-1405) also led invasions into the region while attempting to restore the Mongol Empire of Genghis Khan. He devastated the North Caucasus. In the 15th century, while Russia began to encroach onto the territory, the local peoples converted to Sunni Islam in order to gain an ally in the Ottoman Empire and stave off Russia. There is a tradition that the word "Chechen" to refer to the inhabitants of the area comes from the village of Chechen-Aul where Russian forces were defeated in 1732. The term had been used in Russian sources 40 years earlier, however. It is likely that the name comes from Arabic sources and became common after the conversion to Islam: the term "Chechen" for these people appears in Arabic sources as far back as the 8th century. Every once in awhile, I decide to throw in bits and pieces that come my way but don't fit into a regular post. I did one here for the date of October 6th, and I gave an Update to cover some odds and ends I came across long after writing about certain subjects. Since Becket has been on my mind (and on these pages) the past week, I cannot help thinking about how many people are probably familiar with him through the movie Becket, based on the play by Jean Anouilh. Made in 1964, it stars Richard Burton as Becket and Peter O'Toole as Henry II. The portrayal of Becket and his relationship with the king is inaccurate; Anouilh based it on a book he bought for his library whose green cover he thought would look good on his shelves. The book was not a true history, but Anouilh found that out after finishing the play, and altering his characters to reflect the truth would involve rewriting the entire play. Perhaps it was the success of Becket that prompted the filming of A Man For All Seasons, based on the play by Robert Bolt of the same name, in which we see the tumultuous consequences suffered by (Saint) Sir Thomas More (Paul Scofield) when he refused to acknowledge King Henry VIII (Robert Shaw, probably better remembered to modern audiences as Captain Quint in Jaws) as the head of the new Church of England. Peter O'Toole would play Henry II again in 1967, against Katharine Hepburn as Eleanor of Aquitaine, in The Lion in Winter. Like Becket, the movie was good, though the history was bad. I've also mentioned The Anarchy as the backdrop for part of Theobald of Bec's career. 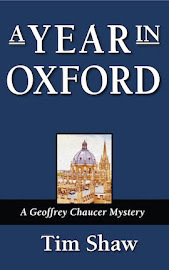 The Anarchy is the era in which the Brother Cadfael mysteries of Ellis Peters take place. Speaking of bad history and historical conspiracy theories, William of Gellone is a prominent figure in Holy Blood, Holy Grail by Baigent, Leigh, and Lincoln. Dan Brown's work shows the influence of this book. ...and that's enough trivia for another several months. Since we brought up Canterbury yesterday, and arguably its most famous archbishop, let us take a look at his predecessor, who was very much at odds with the King of England for the same reasons, but hasn't made it into as many history books. Theobald (c.1090-1161) was born in Normandy. He joined the abbey at Bec as a Benedictine and became its abbot in 1137. A year later, King Stephen of England appointed him the Archbishop of Canterbury. Theobald's relationship with the king was not ideal, especially when he clashed with the king's younger brother, Henry of Blois, who happened to be the Bishop of Winchester. Theobald was Henry's superior, but when your brother is the king, I suppose you tend to think you can get away with a little insubordination. Henry was appointed papal legate by Pope Celestine II, giving him some extra authority, but when Celestine died and Pope Innocent II (mentioned here) took the throne of Peter, Henry lost his position. Innocent did not like King Stephen, and wanted to appoint Theobald as his legate. This required Theobald to travel to meet the pope, which King Stephen forbade. Theobald went anyway. Which brings us to the major issue between Theobald and King Stephen—and it's the same issue that created the greatest difficulties between Thomas Becket and King Henry II: who makes the decisions, the leader of the country or the leader of the church? The Archbishop was appointed/approved by the king, but did that give the king authority over everything the archbishop did in the future? One of Theobald's acts that exacerbated this conflict between temporal and spiritual authority was a synod Theobald called in 1151. It comprised mostly the bishops of the land, but the king and his son and heir, Eustace, were invited. The synod made eight new statutes, including ones forbidding taxing church property, or seizing church property, or prosecuting clergy in the royal courts as opposed to church courts. The civil war ("The Anarchy"; see above) that came not long after the death of Eustace on the White Ship tore England apart for years, until the Treaty of Wallingford. Ironically, the negotiations that brought peace between Stephen and Henry of Anjou (later King Henry II) were managed by Theobald and his long-time enemy, Henry of Blois. When Stephen died in October 1154, Theobald attended him on his deathbed; Stephen named Theobald regent until Henry could take up the reins of power. Although the two had feuded, there is evidence of mutual respect that allowed them ultimately to work together. *The Capetian Dynasty followed the practice of crowning the heir while his predecessor was still alive, previously posted about here. 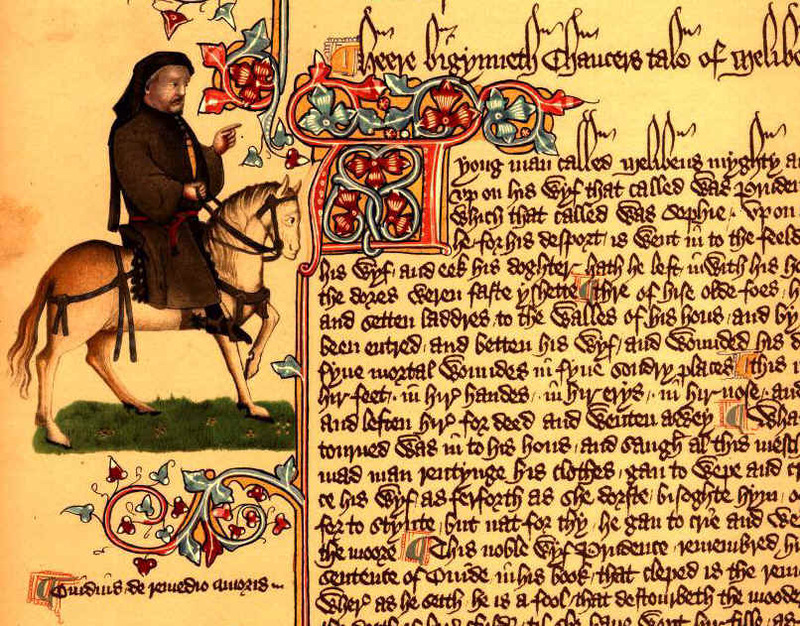 Today, however, we mention Geoffrey Chaucer, because today is thought to be the day of the year when his pilgrims set out on their journey in The Canterbury Tales. Also, 17 April 1397 is considered to be the day that he first gave a public reading of his most famous work at the court of Richard II. Spring was the time when folk "longed to go on pilgrimages" because they had been cooped up indoors all winter and the roads were finally becoming navigable. Canterbury was a common goal for pilgrimages because it held the shrine of Thomas Becket, Archbishop of Canterbury from 1162-1170, who was killed during the reign of Henry II by four knights who were acting either on behalf of the King or were removing the king's rival on their own in order to curry favor. He was universally loved by the population of England, and was declared a martyr by Pope Alexander III in 1173. While we're on the subject, let's make something clear about The Canterbury Tales: it is not a complete work. In the collection, the proposal for the pilgrims is that they would each tell two tales heading to Canterbury and two tales coming back, after which their Host would judge the best tale. Chaucer's intent was possibly to top Boccaccio's Decameron with its ten tales each day for ten days. We have barely over 30 tales (and some of them fragmentary), a far cry from the 120 we could expect if he completed the work. Madaba, a town east of the Dead Sea, suffered from a devastating earthquake in 746 and was left to become wilderness. Centuries later, Madaba began slowly to be restored as a habitable city. In 1884, while the ancient ruins of a church were being cleared to make way for a new Greek Orthodox church, workers discovered a mosaic on the floor. The Madaba Mosaic Map is considered a reliable source of data on Byzantine-era Jerusalem because of the detail with which it is constructed. Known old structures such as the Damascus Gate, the Tower of David, the Church of the Holy Sepulchre and others are depicted with enough detail to distinguish them from simple symbolic images. The detail even allows scholars to date the map: Jerusalem shows the Nea Church, which was built and in use by 542, but does not show any changes or structures built after 570. In fact, the Nea Church was only able to be discovered by archaeologists when they used the Madaba Mosaic as their cue for where to dig! Furthermore, the exact location of the ancient Jewish city of Askalon/Ashkelon was uncertain until the Madaba Mosaic showed where it was on the coast. The floor mosaic faced east, toward the altar. Therefore, when one was facing the altar, one was facing in the proper direction to orient the map with the real world. All the inscriptions are in Greek. The map extends from Lebanon in the north to the Nile Delta, and the Mediterranean to the Eastern Desert. The original dimensions were 21 meters by 7 meters and would have required over 2,000,000 individual tiles, but damage over the years has reduced it by about a third, to 16x5 meters. We do know that some of it was damaged deliberately in the 8th century when Muslim rulers had depictions of people removed. Now carefully preserved, it can be seen in the Greek Orthodox Church of St George. A cross-shaped church in Ethiopia, carved from rock. In the Middle Ages, the evidence suggests that Ethiopia was a Christian nation surrounded by hostile Muslim territories. Medieval manuscripts explain that there was a Solomonic dynasty in Ethiopia—that is, the heirs of King Solomon, descended from the son born to the Queen of Sheba. Unprovable, but it would explain the Christian presence in that part of the world. In fact, "Dawit I" is what he is called in the West; Ethiopian sources call him "Dawit II," because they consider the first "Dawit" to be King David. One of the members of the heirs of Solomon was Dawit I (1382-1413). There are stories that Dawit led armies against his Muslim neighbors to the east, and that he also advanced against the emir that held Egypt at the time, until the emir asked the Patriarch of Alexandria to tell Dawit to cease in order to preserve the peace in the kingdom. There is also reason to believe that he was in communication with Europe, making a request to Venice to send him artisans for the beautification of his realm. Documentary evidence exists that this request reached Venice in June 1402, and that 5 artisans did leave for Ethiopia. We don't know if they ever arrived, but we can turn to circumstantial evidence. The Portugese missionary and explorer, Francisco Álvares (c.1465-c.1540), claims to have seen a Venetian chalice during his six years in Ethiopia. Also, an unsigned manuscript exists that documents a trip from Venice to Rhodes, Cyprus, Jerusalem, Cairo, and finally to the court of Prester John at Shewa, a region in Ethiopia that has Addis Ababa (Ethiopia's modern capital) at its center. (Prester John was often said to have his kingdom "in India"; for most Europeans, however, geography outside of Europe was a pretty vague topic. You can learn more about Prester John here and here). This itinerary shows an unambiguous knowledge of the stages of a journey from Venice to Ethiopia, suggesting that perhaps the legend of Dawit's interest in European artwork was based on truth. Alas, Dawit died young, kicked in the head by a horse. He is interred at a monastery on Daga Island in Lake Tana, the source of the Blue Nile, along with other members of his dynasty. 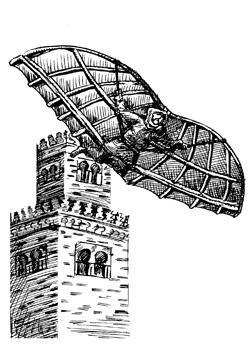 Did a monk of the 11th century accomplish the first manned flight? There is reason to believe so. In the Gesta Regum Anglorum [Deeds of the English Kings] of William of Malmesbury, we read of a monk named Eilmer in Malmesbury Abbey who launched himself from the Abbey's tower with a set of home-made wings. According to the story, he glided more than a furlong (a furlong is 220 yards, or just over 200 meters). Then, suddenly realizing how precarious his position was, he panicked, lost control, and crashed, breaking both legs. He had extreme difficulty walking for the rest of his life. How likely is this story to be true? Let's first consider what we might call "incidental" evidence. William is not just reporting a legend: although he lived after Eilmer, he was in the same Abbey, and very likely got the story from elders who knew Eilmer and had witnessed the experiment first-hand. William also records a curious detail: that Eilmer ever after claimed his failure was due to not constructing a tail for his device. This suggests that Eilmer really did study birds in flight, and realized that a tail is also important to steer and brake for landing. Unfortunately for the history of manned flight, the abbot forbade him or anyone from repeating the crippling experience. The Abbey was situated at a cliff edge over the Avon River that would have created strong updrafts. Eilmer would have seen how jackdaws use the strong updraft to glide and soar without the need to flap. The tower would have been about 80 feet high, giving him additional altitude for catching an updraft. If Eilmer were a small man, calculations suggest that a light and strong frame of willow or ash, covered with parchment or light cloth, would only need an area of 100 square feet to support his weight. William says the wings were attached to Eilmer's hands as well as feet—this supports the notion that they covered a larger area than just wings attached to arms. Local legend says his landing spot is an area now called "Oliver's Lane." (Ralph Higden's Polychronicon—mentioned here—erroneously referred to Eilmer as Oliver, and the name stuck.) Given the constant wind conditions and the distance he is supposed to have flown, Oliver's Lane is precisely where modern calculations based on wind currents place his likely landing spot. The gliding flight would have lasted about 15 seconds. He lived a long time afterward, becoming known for scholarship. His writing on astronomy existed and was well-known into the 16th century, but has been lost since. Also lost to history is the tavern "The Flying Monk" in Malmesbury, which has since been replaced by a shopping center.